Magma is a term first introduced into geologic literature in 1825 by Scope, who referred to it as a “compound liquid” consisting of solid particles suspended in a liquid, like mud. Measurements on extruded magma (lava), together with evaluations of mineral geothermometers in magmatic rocks and experimental determinations of their melting relations, indicate that temperatures of magmas near the surface of the Earth generally range from about 1200°C to 700°C; the higher values pertain to mafic compositions, the lower to silicic. Very rare alkali carbonatitic lavas that contain almost no silica have eruptive temperatures of about 600°C. Extruded magmas are rarely free of crystals, indicating that they rarely are superheated above temperatures of crystallization. Densities of magmas range from about 2.2 to 3.0 g/cm3 and are generally about 90% of that of the equivalent crystalline rock. Magma in general consists of a mobile mixture of solid, liquid, and gaseous phases. The number and nature of the phases constituting a magma depend, under stable equilibrium conditions, on the three intensive variables P, T, and X (concentrations of chemical components in the magma). At sufficiently high T, any rock melts completely to form a homogeneous liquid solution, or melt. Except for carbonatite magmas, melts consist mostly of ions of O and Si hence the alternate appellation silicate liquid but always contain in addition significant amounts of Al, Ca, H, Na, and so on. 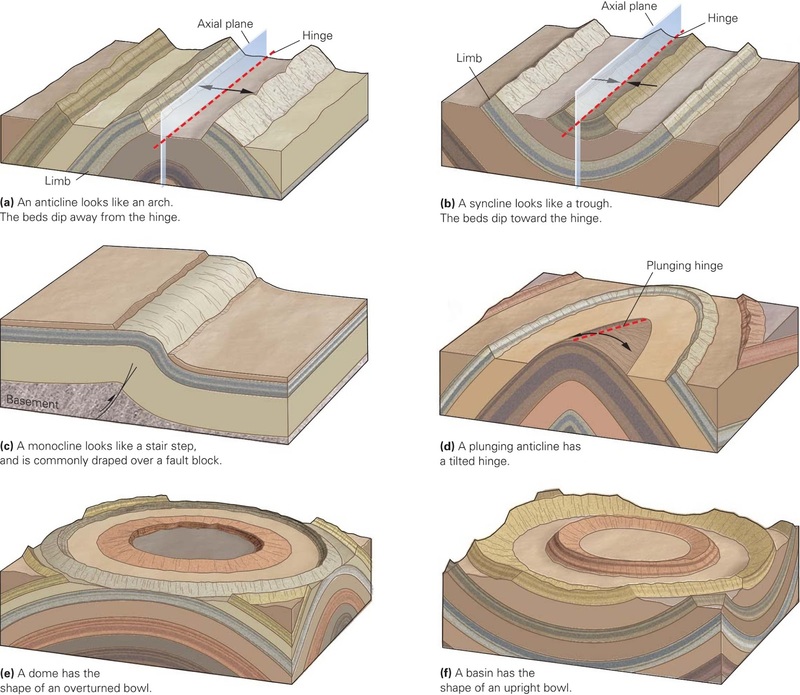 Examples of different types of magmas are shown schematically in below figure. Only in some unusually hot systems will a magma consist wholly of melt and no other phases. In most instances, a melt is only part of the whole magma, but is always present and gives it mobility. Hence, melt and magma are generally not the same. To a significant extent, the properties of the melt largely govern the overall dynamic behaviour of the whole magma. Rare magma systems consist at equilibrium of two physically distinct melts one essentially of carbonate and the other of silicate, or both are silicate but one is silicic and the other very rich in Fe. Each of these immiscible melts has distinctive properties, such as density. Oil and water are familiar immiscible liquids. The configuration of ions in a melt its atomic structure largely dictates many of its significant properties. In pictorial representations of crystalline, liquid, and gaseous states, individual atoms have to be drawn as fixed in position relative to one another, but these are only their average, or instantaneous, positions. Even in crystals above absolute zero (0K), individual ions have motion. In glasses that are supercooled very viscous melts, ions experience vibrational motion: small periodic displacements about an average position. But at temperatures above a glass-melt transition, approximately two-thirds to three-quarters the melting T in degrees Kelvin, ions in the melt have more mobility and can break their bonds with neighbouring ions and wander about, forming new configurations. In a flowing melt, bonds are broken and bond angles and distances are distorted, but after deformation ceases, the ionic array may have sufficient time to reform into a “relaxed” equilibrium structure. Many studies of melts in the laboratory using nuclear magnetic resonance, vibrational spectroscopy, and X-ray analyses reveal a lack of long-range (on the scale of more than a few atomic bond lengths) structural order and symmetry that characterize crystals. However, melts possess a short-range structural order in which tetrahedrally coordinated Si and Al cations are surrounded by four O anions and octahedrally bonded cations such as Ca and Fe2+ surrounded by six O anions roughly resemble those in crystals. Because silica is the most abundant constituent in most natural melts, the fundamental structural unit is the (SiO4)4 - tetrahedron, as it is in silicate minerals. Conceptual models of the atomic structure of silicate liquids can be constructed on the basis of these observations. Figure below depicts these models for liquid silica (SiO2) and CaMgSi2O6; the latter in crystalline form is diopside pyroxene. Conceptual models of atomic structures of silicate melts compared with the symmetric lattice of a crystalline solid. (a) Crystalline silica (high tridymite). Layers of hexagonal rings of Si-O tetrahedra with alternating apices pointing up and down are stacked on top of one another, creating a three-dimensional structure in which each oxygen is shared by two silicons. Tetrahedra with apices pointing up have the upper apical oxygen left out of the drawing so as to reveal underlying silicon. Dashed line indicates outline of one unit cell in the lattice. (b) Model of liquid silica. Si-O tetrahedra are slightly distorted relative to the crystalline lattice. Long-range order is absent. Structure is highly polymerized because all tetrahedra are interconnected by bridging oxygen anions. (c) Model of liquid CaMgSi2O6 showing less polymerization than that of liquid silica. Note presence of network-modifying cations (Ca and Mg) and non-bridging oxygen, neither of which occurs in the silica melt. Because the entropy of melting of crystalline silica (i.e., the change in entropy from the crystalline to the liquid state) is relatively small, there can be little change in the degree of order in the atomic structure of the melt relative to the crystalline state. Thus, a model for liquid silica is a three-dimensional network of somewhat distorted Si-O tetrahedra, not unlike the corresponding structure of crystalline silica. Short range order is roughly similar to that in the crystalline state, but long-range order, as would be evident in a symmetrical crystal lattice, is absent. The silica melt can be viewed as a three-dimensional network of interlinked chains, or polymers, of Si-O tetrahedra. On the other hand, in the model of the CaMgSi2O6 melt, these string like polymers are shorter, less intricately linked, and interspersed among octahedrally coordinated cations of Ca and Mg. This melt is not as polymerized as liquid silica. non-bridging oxygens in non-tetrahedral bonding arrangements. The ratio of non-bridging oxygens to network-forming, tetrahedrally coordinated cations chiefly Si and Al is a measure of the degree of polymerization in a melt; small ratios correspond to high degrees of polymerization. In completely polymerized liquid silica, the ratio = 0. In partially polymerized liquid CaMgSi2O6 it is = 2/1 = 2. The atomic structure of naturally occurring melts is more complex than these simple models. Despite considerable research, many details are not understood. Other ions of different size, charge, and electro-negativity, such as Al3+ , Ti4 +, Fe3+ , P5+ , H- , or F- make natural melts more complex. In this milieu, mobile cations compete for available anions, principally oxygen, in order to satisfy bonding requirements and to minimize the free energy of the melt. This is not quite the same situation as in crystals, where cations have more or less fixed sites of a particular coordination in the ordered lattice. In addition to the widespread (SiO4)4 - tetrahedra in melts, there are less abundant neighbouring tetrahedra of more negatively charged (Al3+ O4)5 - and (Fe3+ O4)5 -. The ionic charge and size of network-modifying cations, which generally form weaker bonds with non-bridging oxygens, can play an important role in melt structure. Network modifiers most commonly include monovalent K and Na; divalent Ca, Mg, Fe, and Mn, and more highly charged, but less abundant high-field-strength cations including P5+ , Ti4 +, and the still less abundant trace elements. The most important dynamic property of a melt its viscosity depends strongly on its atomic structure. Because viscosity is a measure of the ease of flow of a melt and the mobility of ions, it should be intuitively obvious that more highly polymerized melts are more viscous. Alternatively, it can be said that, because non-bridging oxygen anions are less strongly bonded to neighbouring cations than bridging oxygens to Si and Al, viscosity correlates with the ratio of non-bridging to bridging oxygens. Increased concentrations of some components can depolymerize melts and reduce viscosity. Even small weight proportions of dissolved water or fluorine can depolymerize silicate melts, making them much less viscous. Also, high-field-strength, network-modifying cations whose charge is generally > 3+ have a strong affinity for oxygen anions and may successfully compete against network-forming Si4+ , Al3+ , and Fe3+ , thus depolymerizing the melt. The role of Fe in melt structures is especially significant because it occurs in two oxidation states. Fe2+ appears to be exclusively a network modifier, whereas Fe3+ can be either a network modifier or a network former. Changes in the oxidation state can therefore affect the degree of polymerization of a melt. Increasing pressure appears to reduce the degree of polymerization somewhat. Because octahedral coordination of Si and Al is favoured in crystalline structures at high P over tetrahedral coordination, similar coordination changes might occur in melts at high P. Some experiments suggest that Al more readily shifts toward octahedral coordination with increasing P than does Si. In conclusion, water-free (“dry”) rhyolite melts have virtually no non-bridging oxygens and are nearly completely polymerized and highly viscous. In andesite melts the ratio of non-bridging oxygens to network forming, tetrahedrally coordinated cations is about 0.2, and in basalt melts it is 0.4–1.2. Consequently, mafic, silica-poor melts are significantly less polymerized and less viscous than dry silicic melts. Isolated system: No matter or energy can be transferred across the boundary of the system and no work can be done on or by the system. Considering the span of time over which most identifiable geologic systems operate, no part of the Earth, nor even all of it, can be considered perfectly isolated because transfers of energy and movement of matter typify the dynamic Earth. 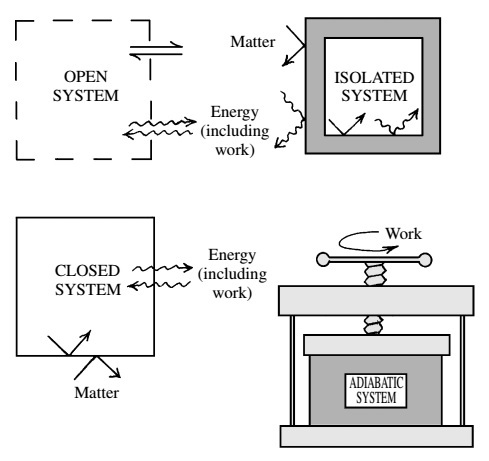 Open system: The opposite of an isolated system. Matter and energy can flow across the boundary and work can be done on and by the system. Most geologic systems are open, at least in the context of their long lifetimes. Closed system: Energy, such as heat, can flow across the boundary of the system, but matter cannot. The composition of the system remains exactly constant. Because movement of matter is slow across boundaries of, for example, a rapidly cooling thin dike, it can be considered to be virtually closed. On the other hand, a large intrusion of magma that remains molten for tens of thousands of years while various fluids move across the wall rock contact is not a closed system. Adiabatic system: A special category of an isolated system is one in which no heat can be exchanged between the system and the surroundings. It is thermally insulated, but energy can be transferred across the system boundary through work done on or by it. Thus, an ascending, decompressing mantle plume or magma body cools as it expands against and does PV work on the surroundings, into which little heat is conducted because the rate of conduction is so slow. End-member thermodynamic systems. Classification is according to flows of matter and energy across their boundary with the surroundings. Any thermodynamic state of a system can be characterized by its state properties, or state variables. Some state properties are extensive in that they depend on the amount of material, such as the mass and volume of some chemicals constituting a system. Other state properties are intensive and are independent of the amount of material present; they have a definite value at each point within the system, such as T, P, and concentration of a particular chemical species. Density (mass/volume) is also an intensive property. For example, at T 25°C and P 1 atm, the density of stable graphite anywhere within a crystal is 2.23 g/cm3 whereas that of diamond is 3.51 g/cm3. P and T are extremely important intensive variables whose change in rock-forming systems is responsible for changes in their state; for example, increasing T causes solid rock to melt. Values of the geobaric and geothermal gradients in the Earth can be used to approximate P and T at a particular depth, assuming these gradients to be uniform. Otherwise uniform gradients can locally be perturbed, such as the geothermal gradient around a shallow crustal magma intrusion. Rock-forming geologic processes can be thought of as thermodynamic processes: those that affect a thermodynamic system as it changes from one state to another.. In a thermodynamic process there could be all kinds of work done on or by the system, flows of heat in or out, chemical reactions and movement of matter, tortuous paths taken, and so forth. However, two ideal, end-member thermodynamic processes can be recognized: irreversible and reversible. 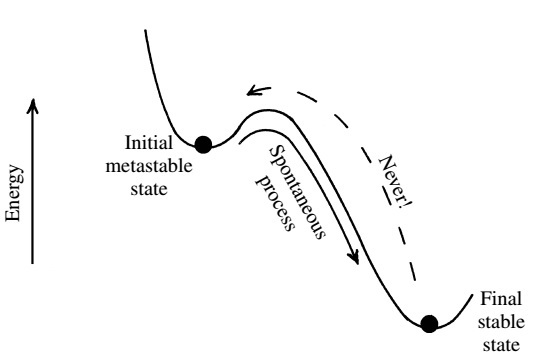 In an irreversible thermodynamic process the initial state is metastable, and the spontaneous change in the system leads to a more stable, lower-energy final state. The conversion of metastable volcanic glass into more stable crystals a process called devitrification under near-atmospheric conditions is one example of an irreversible process. The energy trough in which metastable glass is stuck has to be surmounted, overcoming the activation energy, before it can move to a lower energy state. The atomic bonds in the glass must be broken or reformed into more stable crystalline structures. Devitrification of glass occurs spontaneously in the direction of diminishing energy, never in reverse (Figure below). Spontaneous, irreversible thermodynamic process. A system in an initial higher-energy metastable state moves spontaneously to a lower-energy, stable state. The reverse never happens spontaneously. In a reversible process, both initial and final states are stable equilibrium states and the path between them is a continuous sequence of equilibrium states. A reversible process is never actually realized in nature; it is a hypothetical concept that is used to make the mathematical models of thermodynamics work, and that’s all that can be said without an extended discussion. In the “scientific” convention, heat added to (or work done on) a system, as in this formulation, is positive and work done by (or heat withdrawn from) the system on its surroundings is negative. 1. Chemical reactions, such as the reaction of quartz plus calcite creating wollastonite plus CO2. 2. A change in state, such as crystals melting to liquid, that occurs at a fixed T once that T is reached in heating a system. 3. 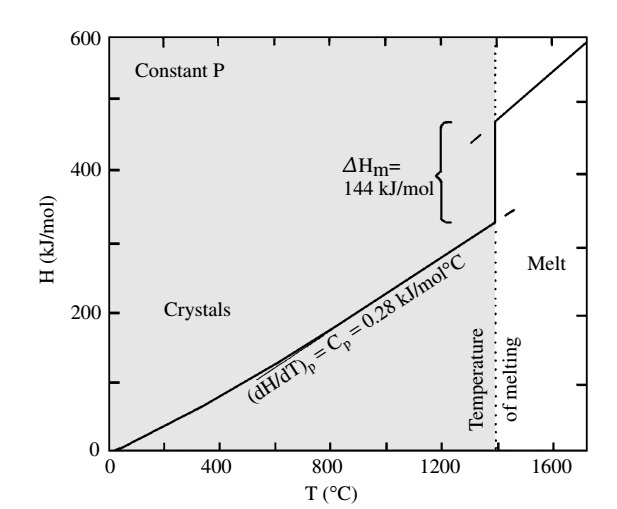 A change in T of the system where no change in state occurs, such as simply heating crystals below their melting T.
Note in Figure below that the latent heat involved in changing the state of the system from liquid to crystal, or vice versa, is similar to the heat absorbed in changing the T of the crystals or liquid by hundreds of degrees. Thus, melting of rock in the Earth to generate magma absorbs a vast amount of thermal energy, which moderates changes in T in the system. Enthalpy-T relations for CaMgSi2O6 at 1 atm. They are either exothermic or endothermic, respectively. If catalyzed by a spark, the reaction between hydrogen and oxygen releases a burst of heat a rapid exothermic reaction, or explosion. Solidification of magma exothermically releases the latent heat of crystallization. In contrast, dissolution of potassium nitrate in water endothermically absorbs heat so that the container becomes cold. Thus, whether heat is released or absorbed in a chemical reaction provides no consistent clue as to the direction a reaction moves spontaneously. Another way to look at spontaneity is in changes in the distribution or concentration of energy. Spontaneous thermal processes lead to a more even concentration of heat. A bowl of hot soup on the table eventually reaches the same T as the room. Heat flows spontaneously from a hot body to a cold, eliminating the difference in T. Without an uneven concentration of thermal energy, or the opportunity for heat flow, no work can be done. As heat flows from an intrusion of hotter magma into the cooler wall rocks, PV work of volumetric expansion is performed on them. The heat also drives endothermic chemical reactions of wall rock metamorphism. Water in an enclosed lake on a high plateau has gravitational potential energy relative to sea level, but so long as it is isolated from sea level and cannot flow, the concentration of energy is uniform and no work can be done. 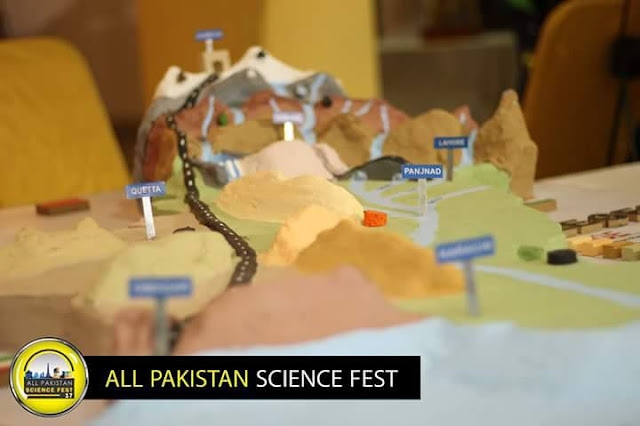 However, in the natural course of events, a river drains the lake into the sea, forming a process path along the potential energy gradient between the high- and low potential-energy levels. Work can then be done, driving turbines to generate electricity, eroding the river channel, transporting sediment, and so on. One statement of the second law of thermodynamics is that spontaneous natural processes tend to even out the concentration of some form of energy, smoothing the energy gradient. A hot lava flow extruded from a lofty volcano cools to atmospheric T as it descends down slope, thereby reducing differences in thermal and gravitational potential energy between initial and final states in accordance with the second law. Eventually, billions of years from now, all of the thermal energy in the Earth will be consumed in tectonism, volcanism, and other processes and dispersed into outer space. No mountains or volcanoes will be erected and erosion in the solar-powered hydrologic system will wear everything down to some common level (assuming the Sun does not run out of nuclear energy!). Without differences in the concentration of thermal and gravitational potential energy no geologic work can be accomplished and the planet will be geologically dead!. The measure of the uniformity in concentration of energy in a system is called the entropy, S. The more uniform the concentration of some form of energy, the greater the entropy. The geologically dead planet will have maximal entropy. Another, more useful, way to define entropy is to relate it to the internal disorder in the system. This provides an alternate statement of the second law: In any spontaneous process in an isolated system there is an increase in entropy, that is, an increase in disorder. The law in this form is illustrated by Figure 3.4, where white and black balls in the boxes represent molecules of two different gases. The spontaneous mixing of the two gas molecules results in an increase in “mixedupness,” disorder, randomness, or entropy. Note that there is no accompanying change in energy in this mixing process. Thus, another driving “force” for a spontaneous process is an increase in entropy, even though there may be no change in the energy. At decreasing T, crystals become increasingly ordered, less atomic substitution is possible, and their entropy decreases. The third law of thermodynamics states that at absolute zero, where the Kelvin temperature is zero (0K = - 273.15°C), crystals are perfectly ordered and all atoms are fixed in space so that the entropy is zero. The boulder-on-the-hill example has two major flaws as an analogy for the way natural systems, in general, change spontaneously from a higher to a lower energy state. First, it isn’t always gravitational potential energy that is minimized. 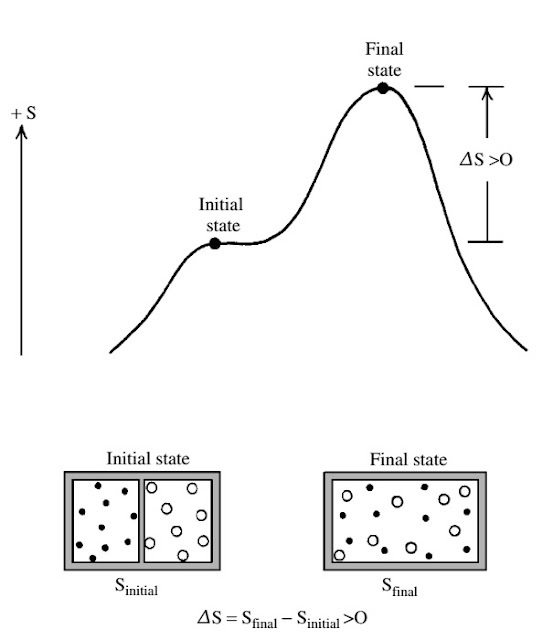 Second, the analogy does not take into account the fact that in an isolated system a process can proceed spontaneously without any change in energy, but it does proceed with increasing entropy figure below. To overcome these two flaws, a new extensive property of a system is defined in such a way as to serve as a universal directionality pointer for spontaneous reactions. Entropy increases in a spontaneous, irreversible process in an isolated system. Bottom left, a hypothetical isolated system a box filled with atoms of two gases (black and white balls) separated by an impermeable wall. Bottom right, the wall has been removed in the box, and the atoms of the two gases have mixed spontaneously and irreversibly as a result of their motion (kinetic energy). An increase in disorder or randomness of the atoms in the system and an increase in entropy, S > 0. No change in energy has occurred. Equation (9) is a useful thermodynamic expression that allows us to make powerful statements regarding the direction of changes in geologic systems as the independent intensive variables of state, T and P, change. The extensive entropy and volume properties of the system are also relevant factors. This is simply the condition for a minimum (or maximum) in G in P-T space where the slope of the tangent to the energy function is zero, or horizontal. Figure below shows a system that has moved to a state of minimal energy and stable equilibrium from a higher-energy, metastable state at constant P and T in a closed (constant composition) system. Note that the energy change, GP,T, between the initial metastable state and the final stable state is negative: GP,T < 0. In some spontaneously changing systems, increasing entropy is the dominant factor, whereas in thers, decreasing energy is the dominant factor. The Gibbs free energy is formulated in such a way that it always decreases in a spontaneous change in the state of a system. In other words, the Gibbs free energy of the final stable state is lower than that of the initial metastable state in figure below. The Gibbs free energy is a thermodynamic potential energy that, like gravitational potential energy for the hypothetical boulders, is the lowest possible in a state of stable equilibrium for a changing system. 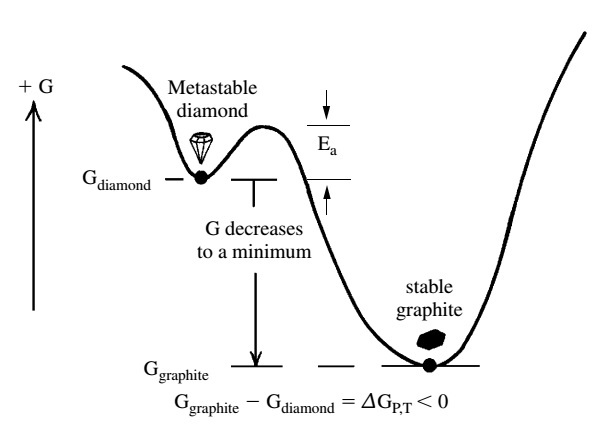 Gibbs free energy decreases in a spontaneous change in a closed system where the initial and final states are at the same P and T. In this example, the energy of diamond is greater than that of graphite at the same P and T, or Gdiamond > Ggraphite, so the change in energy, GP,T, in the spontaneous process is negative, or Gdiamond - Ggraphite = GP,T < 0. Note the activation energy barrier, Ea , that must be surmounted in order for the change to occur. Scientists have traditionally sought regularity, order, and predictability in their investigations of the natural world. However, for the petrologist, the continuity of rock compositions, the seemingly endless variety of fabric, and the wide range of geologic environments in which rocks form pose formidable obstacles to erecting a well ordered, simple, single rock classification. Unlike in the plant and animal kingdoms, which have discrete species, no such natural divisions exist in rocks. Rocks are more like complex, highly variable biological ecosystems; minerals constituting a rock are like the plant and animal species constituting an ecosystem. Despite the obstacles, a consistent classification of rocks is essential for communication with other petrologists, who should all speak the same language of clasification; a particular rock name should convey thesame meaning to every petrologist, regardless of his or her native tongue. In addition, classification serves as an important means of systematizing information. Through appropriate and relevant classification, meaningful patterns in composition, fabric, field relations, and, therefore, origin can be perceived. As all classifications of rocks are the fruits of the human mind attempting to erect discrete subdivisions where none exists in the natural, uninterrupted continuum of rock properties, every classification is, to some degree, arbitrary and imperfect. There are many different criteria for classification; consequently, many different labels exist for the very same rock. Each has its own benefit and use; none cancombine the merits of all. “A rock may be given one name on the ground of field occurrence and from hand lens examination, only to require another when it is studied in thin section, and perhaps a third when it is chemically analyzed. We review here only the most fundamental rock terminology based on fabric as it is generally introduced in a beginning geology course. Magmatic fabric is essentially governed by time-dependent (kinetic) processes in the solidifying magma, such as its rate of heat loss, or cooling. Four principal types of fabric occur in magmatic rocks: phaneritic, aphanitic, glassy, and volcaniclastic. The first two refer to the dominant crystal grain size, which ranges over several orders of magnitude, rom 10 -6 to 10 m.
Phaneritic applies to rocks that have mineral grains sufficiently large to be identifiable by eye (minute accessory minerals excepted). This texture is typical of rocks crystallized from slowly cooled intrusions of magma. Aphanitic rocks have mineral grains too small to be identifiable by eye and require a microscope or some other laboratory device for accurate identification. Aphanitic texture is most common in rapidly solidified extruded magma but can also be found in marginal parts of magma intrusions emplaced in the cool shallow crust. Some magmatic rocks contain essentially two grain-size populations and few of intermediate size; such texture is said to be porphyritic. The larger grains are phenocrysts, and the smaller constitute the groundmass, or matrix. Porphyritic aphanitic rocks are far more common than porphyritic phaneritic rocks. Glassy, or vitric, rocks contain variable proportions of glass, in contrast to holocrystalline rocks made entirely of crystals. A vitrophyre is a porphyritic rock that contains scattered phenocrysts in a glassy matrix. Consolidation of volcaniclasts produces volcaniclastic rock types that are classified according to their particle size. The location where magma was emplaced provides a basis for rock classification. Some petrologists recognize three categories for rocks solidified from magmas emplaced onto the surface of the Earth (volcanic or extrusive), into the shallow crust (intrusive hypabyssal), and into the deep crust (intrusive plutonic). The first and the last categories are readily distinguished on the basis of their field relations but less directly on the basis of their grain size, degree of crystallinity (proportion of crystals to glass), and mineralogical composition. Magmas emplaced onto the surface of the Earth as coherent lava flows or as fragmental deposits form extrusive, or volcanic rocks. These rocks are typically aphanitic and glassy. Many are porphyritic. Some have fragmental (volcaniclastic) fabric. High-T disordered feldspars are common, so that alkali feldspar, where present, is a clear sanidine. Other minerals that occur only at high-T and low-P in volcanic environments including leucite, tridymite, and cristobalite are found in some volcanic rocks. Amphiboles and biotite, especially where they occur as phenocrysts, are commonly partially altered to fine-grained anhydrous aggregates of Fe oxides, pyroxenes, and feldspars. Phenocrysts of feldspar and quartz commonly contain inclusions of glass. Intrusive, or plutonic, rocks form where magma was intruded into preexisting rock beneath the surface of the Earth as intrusions, or plutons. Plutonic rocks are typically phaneritic. Monomineralic rocks composed only of plagioclase, or olivine, or pyroxene are well known but rare. Amphiboles and biotite are commonly partially altered, usually to chlorite. Some granites contain muscovite, which is exceedingly rare in volcanic rocks. Perthite an intergrowth of sodic and potassic feldspar is widespread and reflects slow cooling and exsolution in initially homogeneous alkali feldspar. Characteristics of intermediate-depth hypabyssal rocks are not clearly distinct from those of volcanic and plutonic rocks. Many occur in shallow crustal dikes, sills, and plugs that represent feeding conduits for surface extrusions of magma. 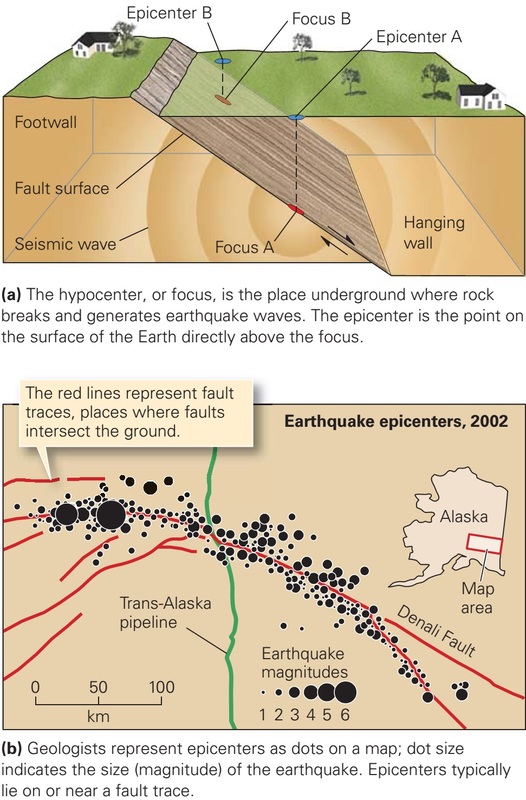 But dikes and sills are also intruded deep in the crust. Hypabyssal rocks can have fabric similar to that of plutonic and volcanic rocks. Because of these ambiguities, many petrologists tend to categorize magmatic rocks in the field simply as plutonic or volcanic. Felsic is a mnemonic adjective derived from the words feldspar and silica. It is a useful appellation for rocks that contain large proportions of feldspar with or without quartz and/or its polymorphs, tridymite and cristobalite. Granite and rhyolite made mostly of feldspar and quartz are examples of felsic rocks. The term felsic also applies to rocks containing abundant feldspathoids, such as nepheline, and to these rock-forming minerals as well. Mafic is a mnemonic adjective derived from the words magnesium and ferrous/ferric. Mafic is a less cumbersome term than the synonymous ferromagnesian. It refers to major rock-forming biotite, amphibole, pyroxene, olivine, and Fe-Ti oxide solid solutions as well as rocks that contain large proportions of them, such as basalt. Ultramafic rocks are especially rich in Mg and Fe and generally have little or no feldspar; an example is the olivine-pyroxene rock called peridotite. Silicic rocks contain large concentrations of silica, manifested by an abundance of alkali feldspar, quartz, or glass rich in SiO2. Examples are rhyolite and granite. The term sialic is used less frequently for rocks rich in Si and Al that contain abundant feldspar and is used especially with reference to the continental crust. Colour is usually the first rock property noticed by the novice. 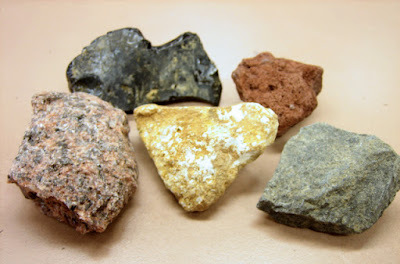 However, a particular rock type can possess a wide range of colors; granites, as just one example, can be nearly white, shades of gray, green, red, and brown. These widely ranging colors reflect equally widely variable colors of the dominant rock-forming feldspars, whose pigmentation is a complex function of minute mineral inclusions, exsolution, and small concentrations of elements such as Fe in solid solution; none of these factors may be petrologically very significant and in any case may be difficult to determine. Color is not a valid basis of rock classification and can, in fact, be highly misleading. Color index has been defined as the modal proportion of dark-colored minerals in a rock. But, in view of the fact that dominant rockforming feldspars can be light- to dark-colored, a more accurate index should be defined on the basis of the proportion of mafic minerals. Leucocratic and melanocratic rocks can be defined as having 0–30% and 60–100% modal mafic minerals, respectively. The classification of magmatic rocks most familiar to the beginning geology student is that of rock types. In contrast to the broadly defined compositional labels just described, a rock type has a arrowly defined composition and a particular fabric. Familiar rock types include rhyolite, andesite, and basalt (all aphanitic) and granite and diorite (both phaneritic). Many rock-type labels have a long and bscure history stemming from miners’ jargon; many are coined from geographic locales, such as andesite from the Andes Mountains of western South America. About 800 igneous rock-type names are listed in the classic four-volume work of Johannsen (1931–1938), written toward the end of an era when petrology was mostly descriptive petrography and the coining of new rock names was in vogue. Today, most of these names have, fortunately, been abandoned and petrologists need have only a working knowledge of a few dozen major igneous rock-type names. Flexible, loosely defined limits could be defined, leaving the details to the individual petrologist guided by the circumstances and need at hand. However, this approach has over the decades resulted in considerable confusion in the geologic literature. The continuous spectrum could be subdivided along specific, well-defined limits that follow as closely as possible a usage agreed upon by as many petrologists as possible. This is the approach of the International Union of Geological Sciences Subcommission on the Systematics of Igneous Rocks, hereafter referred to as the IUGS. The IUGS system of classification is a universal standard that can eliminate individual biases and contradictions among petrologists. The IUGS rock-type classification for phaneritic (generally plutonic) rocks, which consist mostly ( 10 modal % but usually more) of felsic minerals. Quartz-rich felsic rocks are also classified; these are collectively referred to as granitic rocks or granitoids. A porphyritic aphanitic to finely phaneritic rock having abundant phenocrysts and occurring in a pluton (intrusion) is called porphyry; depending on its modal composition it may be a granite porphyry, granodiorite porphyry, or other. Uniformly fine-grained phaneritic, very leucocratic granites composed almost entirely of feldspar and quartz that typically occur in thin dikes within a coarser-grained, somewhat more mafic granitic pluton are aplite. Commonly associated with aplite are equally leucrocratic rocks called pegmatite; these are phaneritic rocks of highly variable grain size in which individual crystals are several centimeters to several meters. Gabbros phaneritic rocks made of plagioclase, pyroxene, and olivine are classified and phaneritic ultramafic rocks that contain < 10 modal % felsic minerals. There are many advantages of a numerical chemical classification. Insights are provided regarding the nature, origin, and evolution of magmas. Rigorous comparisons can be made between members of suites of rocks and petrotectonic associations. The advantages of chemical classifications are obvious for very finegrained rocks, whose mineralogical compositions may be difficult to determine, and certainly for glassy rocks (but beware of loss of Na and other possibly mobile elements). Aphanitic and glassy volcanic rocks can correspond more closely to the composition of the magma from which they formed than do porphyritic and phaneritic rocks, which may have been derived from magmas that experienced crystal accumulation during their evolution. Magmatic rocks whose characterizing minerals have been obliterated by alteration or metamorphism can be analyzed to reveal their original nature, provided diagnostic chemical elements have not been significantly mobilized during recrystallization. However, an inherent weakness of purely chemical classifications is they have little or nothing to say regarding the effects of geologic processes on fabric and of different P T conditions that govern mineralogical composition. A rigorously quantitative chemical classification of aphanitic and glassy, usually volcanic, rocks must be tempered by the fact that most rock-type names were established decades, and in some instances centuries, ago, when few if any chemical analyses were available and names were based upon mineralogical and modal compositions. All analyses were sorted as to rock-type label, such as “andesite” and “dacite,” irrespective of the classification scheme used. 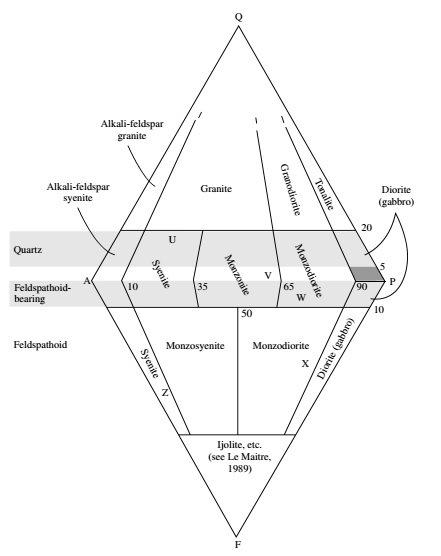 IUGS classification of aphanitic and glassy volcanic rock types. Overlap between the two fields of andesite and dacite reflects inherent variability in their composition an attribute of all rock types no matter how defined. Nonetheless, averages of these two rock types are quite different. Average compositions of common magmatic rock types, which represent the opinions of thousands of petrologists over many decades. 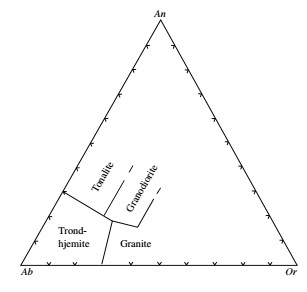 All of the common volcanic rock-type names were so examined and bounding lines drawn on a total alkalies-silica diagram in such a way as to recognize a “consensus” composition. Rock samples to be classified should be as fresh as possible (unweathered and unaltered). Analyses must be recalculated to 100% volatile-free before plotting. A rock of basaltic composition in which the grain size is marginally phaneritic and transitional into gabbro is diabase (alternatively called dolerite by United Kingdom geologists). Diabase commonly occurs in dikes and sills but also constitutes local lava flows. An olivine-rich basalt or picrobasalt having MgO > 18 wt.% is called picrite if (Na2O + K2O) = 1- 3 wt.% and komatiite if (Na2O + K2O) <1 wt.% and TiO2 is low, generally <1 wt.%. Komatiites are commonly ultramafic and composed essentially of olivine and pyroxene so that they are chemically a peridotite, but their glassy to aphanitic texture precludes use of this phaneritic name. The chemical classification can be appended to fabric heteromorphs that solidified from chemically similar magmas but have different fabrics. For example, chemically defined rhyolite can be, depending on fabric, rhyolite tuff, rhyolite breccia, rhyolite obsidian (wholly glass), rhyolite vitrophyre, and rhyolite pumice (vesicular glass). 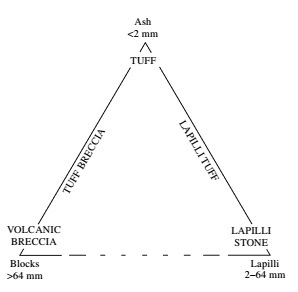 A preliminary IUGS classification for volcanic rocks based upon modal proportions of phenocrysts may be used in the field and before chemical analyses are available. This classification should never be final because the groundmass of porphyritic aphanitic or glassy rocks will always be poorer in plagioclase than the assemblage of phenocrysts because of the way magmas crystallize. A rock containing sparse plagioclase as the dominant or sole phenocryst could be a dacite, rhyolite, or trachyte. As defined here, acid and basic have no reference whatsoever to hydrogen ion content, or pH, as used in chemistry. (Long ago it was erroneously believed that SiO2 occurred as silicic acid and metallic oxide components, such as CaO and FeO, as bases in magmas.) These four categories have no direct correlation with modal quantity of quartz in the rock, although as a general rule, acid rocks do contain quartz and ultrabasic ones do not. Two rocks having identical concentrations of silica may have widely different quantities of quartz,and two rocks of similar quartz content may have different silica concentrations, depending upon the composition and quantity of other minerals in the rock. Roughly speaking, acid rocks are silicic, basic are mafic, and ultrabasic are ultramafic. Near the beginning of the 20th century, three petrologists and a geochemist devised an elegant procedure (from whose surnames the acronym CIPW is formed) for calculating the chemical composition of a rock into a hypothetical assemblage of water-free, standard minerals. These standard normative minerals are designated in italics, such as Q , An, Ol, to distinguish them from the actual rock-forming minerals in the rock. Normative minerals are some of the simple end members of the complex solid solutions the actual minerals in the rock comprise. A complex solid solution, such as hornblende, is represented by several simpler normative minerals. What are the benefits of the normative calculation? Because of extensive solid solution in the major rock forming minerals, substantial variations in whole-rock chemical composition may not be evident in any obvious variations in mineralogical or modal composition. Basaltic rocks are an example. Much the same assemblage of plagioclase, clinopyroxene, olivine, and Fe-Ti oxides can constitute basalt, trachybasalt, and basanite. The norm facilitates comparisons between these basaltic rocks as well as others in which solid-solution minerals conceal whole-rock chemical variations. Aphanitic and, especially, glassy rocks are readily compared. Mica- and amphibole-bearing rocks that crystallized from hydrous magmas can be compared with rocks lacking hydrous minerals that crystallized from dry magmas of otherwise similar chemical composition. Moreover, rock compositions cast as norms can be easier to relate to the results of experimental laboratory studies of simplified, or model, rock systems. 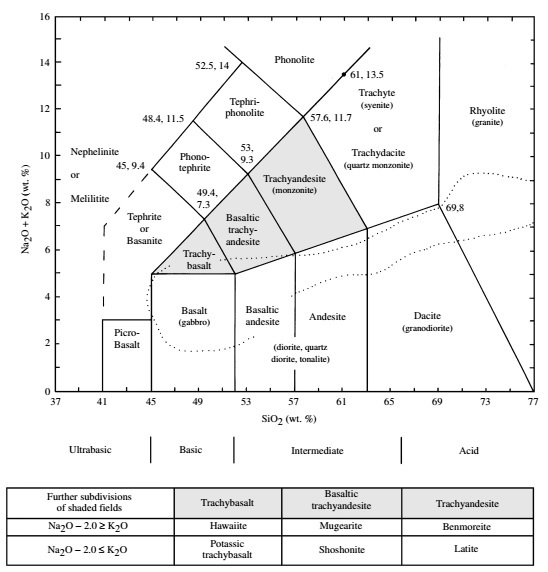 Once again, note the difference in relative molar proportion of SiO2:Na2O 6:1 in albite and 2:1 in nepheline. Creating one mole of nepheline from one mole of albite liberates more silica than does conversion of one mole of orthopyroxene to one mole of olivine. 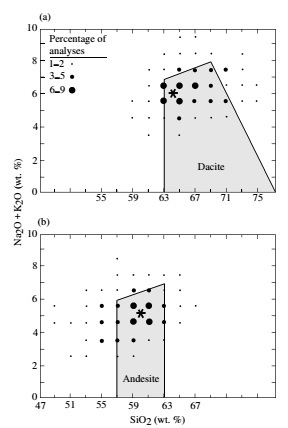 Hence, modest silica deficiencies in rocks are manifest by olivine in lieu of orthopyroxene, whereas greater deficiencies are manifest by nepheline in lieu of sodic plagioclase. The normative calculation serves as a model for a crystallizing magma and illustrates the concept of the degree of silica saturation. Consider a simple hypothetical magma consisting only of O, Si, Al, and Na. If there is an excess of molar SiO2 relative to that needed to make albite from Na2O, that is, SiO2/Na2O >6, then the magma can crystallize quartz in addition to albite. (In a natural magma, the albite would be in solid solution in plagioclase and/or alkali feldspar.) This magma and the corresponding rock are silica-oversaturated. If the magma contains SiO2 andNa2O in the exact ratio of 6, then these two constituents can only combine into albite; the magma and rock are silica-saturated. If the molar ratio SiO2/Na2O <6 but >2 in the magma, then there is insufficient SiO2 to combine with all of the Na2O into albite and some nepheline is created instead; the magma and rock are silica-undersaturated. If the molar ratio SiO2/Na2O = 2 in the magma, then there is insufficient SiO2 to combine with the Na2O to create any albite at all and only nepheline can be produced; the magma and rock still qualify as silica-undersaturated. In real magmas and corresponding rocks that contain Mg, Fe, Ca, K, Ti, and so on, in addition to O, Si, Na, and Al, the concept of silica saturation still applies. In the classification that follows, the degree of saturation is manifested in normative minerals (shown in italic letters) and with less accuracy by real minerals (in parentheses). Silica-oversaturated rocks contain Q (quartz or its polymorphs—cristobalite and tridymite), such as granite. Silica-saturated rocks contain Hy, but no Q, Ne, or Ol (no quartz, feldspathoids, or olivine), such as diorite and andesite. Silica-undersaturated rocks contain Ol and possibly Ne (Mg-olivine and possibly feldspathoids, analcime, perovskite, melanite garnet, and melilite), such as nepheline syenite. Al2O3 is the second most abundant constituent in most magmatic rocks and provides another means of classification, especially for felsic rocks, such as granitic ones. The alumina saturation index is defined as the molecular ratio Al2O3/(K2O + Na2O + CaO), which equals 1 in feldspars and feldspathoids. In magmas crystallizing feldspars and/or feldspathoids, any excess (ratio > 1) or deficiency ( <1), respectively, of Al2O3 must be accommodated in mafic or accessory minerals. In alumina-oversaturated, or peraluminous, rocks, excess alumina is accommodated in micas, especially muscovite, in addition to Al-rich biotite, and in aluminous accessory minerals such as cordierite, sillimanite, or andalusite, corundum, tourmaline (requires boron), topaz (fluorine), and almandine-spessartine garnet. (But beware: The latter three minerals also occur as vapor-phase precipitates in some metaluminous rocks.) After allocation of CaO for apatite, peraluminous rocks containnormative corundum, C. In alumina-undersaturated, or metaluminous, rocks, deficiency in alumina is accommodated in hornblende, Al-poor biotite, and titanite (but its stability also depends on other compositional properties of the magma including oxidation state). After allocation of CaO for apatite, metaluminous rocks contain normative anorthite, An, and diopside, Di (or wollastonite, Wo). 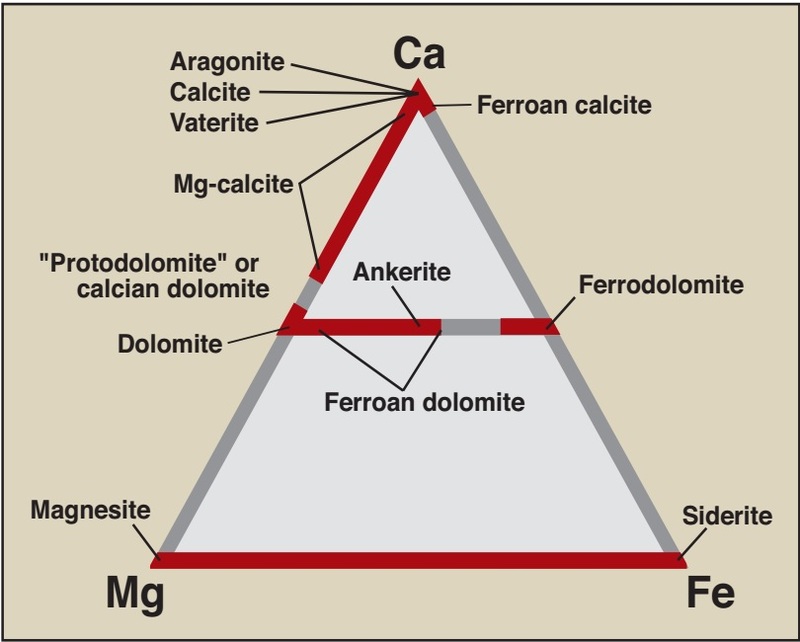 A further constraint on metaluminous rocks is that they have Al2O3/(K2O + Na2O) > 1, whereas peralkaline rocks have Al2O3/ (K2O + Na2O) < 1. In peralkaline rhyolites and granites the alumina deficiency (alkali excess) is accommodated in alkali mafic minerals such as aegirine end-member pyroxene (NaFe3 +Si2O6) and the alkali amphiboles riebeckite richterite, and aenigmatite in which Fe2O3 and TiO2 substitute for Al2O3. Peralkaline rocks contain normative acmite or sodium metasilicate (Ac or Ns) and lack normative An. Real feldspars in peralkaline rocks contain little of the anorthite end member. Peralkaline rhyolites can be further subdivided into comendites in which Al2O3 > 1.33 FeO + 4.4 (on a wt.% basis), and pantellerites, in which Al2O3 <1.33 FeO + 4.4. Peralkaline rocks can be silica-oversaturated, -saturated, or -undersaturated, as in, for example, comenditic and pantelleritic trachytes. An inherent weakness of classifications depending on the ratios of alumina or silica to alkalies is that Na and K can be mobilized and transferred out of a magma by a separate fluid phase. For example, escaping steam from cooling hot lava flows carries dissolved Si, Na, and K. However, Al tends to be less mobile. Initially metaluminous magma can, therefore, become peraluminous after alkali loss. Glasses can also lose alkalies relative to Al during high-T alteration or during weathering. A clue to preferential alkali loss is the presence of metaluminous minerals as phenocrysts, formed prior to extrusion, in a glassy matrix.